Our restaurant is situated close to Casole d’Elsa and offers traditional and innovative Tuscan cuisine. The attention to details and the research for local products of best quality are influencing our dishes as well as a look at new cooking methods or at other Mediterranean cooking traditions. Gluten-and lactose-free dishes are having a permanent place on our menu, such as vegetarian or vegan dishes. Open Daily from 12.00-14.30 h and starting from 6.00 p.m.
We serve Pizza also for Lunch. With take away service! 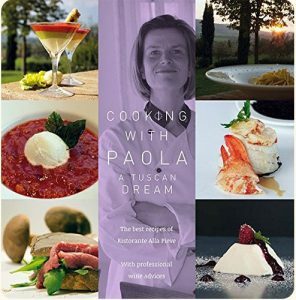 Cooking with Paola – a Tuscan dream. The cookbook is ready ⇒ order now! In our in-house wine store you will find a broad selection of fine wines, organic olive oil, grappa directly from the winery, as well as various accessories. Have look at our online-shop too: www.cultodivino.com. We offer worldwide shipping services. A cultural enrichment of our ambience are the colorful etchings by the artist Simon Dittrich and the handmade and hand-painted ceramic and terracotta exhibits from the artists Anna Incerti.